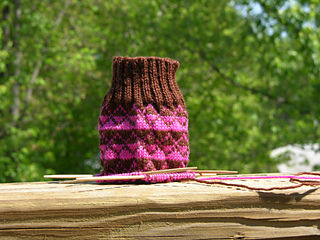 Pattern Summary: Instructions include variations for use with 4 or 5 DPN’s, or two circular needles. Complete instructions are included for both top down and toe-up. 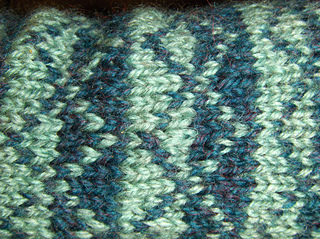 Pattern Section: This pattern is in the ‘Six-stitch stranded patterns’ section. Patterns in this section have different patterns on the cuff and the foot and include a chart for both The pattern also warns that since this is a stranded pattern, it will be less elastic than a sock knit with one yarn. 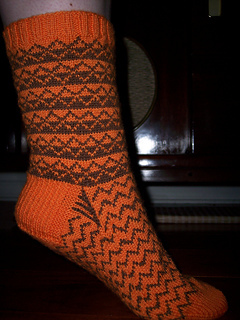 The color charts for the cuff and the sole are on page 104, and the sock pattern starts on page 53.